The FireKing CF4436-D is a perfect choice for bankers box storage or large documents and drawings. Ask how you can get a $50 instant rebate on your purchase today! The FireKing Record Storage Cabinet is the Biggest Name In Records Protection. Literally. The FireKing CF4436-D Storage Cabinet is the best choice for oversized documents, binders, end-tab filing, Bankers Box, and other valuable paper records that need filed. 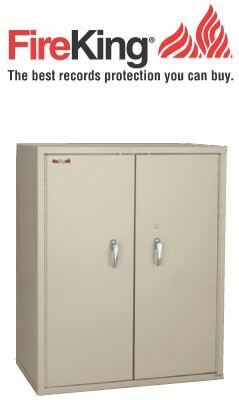 Complete with adjustable shelves, this fireproof cabinet is also equipped with a high-security Medeco key lock and scratch-resistant finish – providing a lifetime quality appearance. 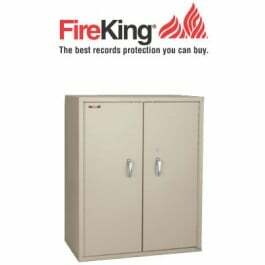 The FireKing Storage Cabinet has a UL Rated 1 hour fireproof classification.